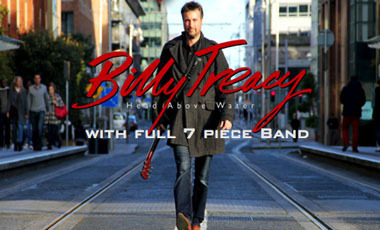 Billy will be performing with a 7 piece band to launch his new album “Head Above Water” in Whelan’s on April 15th. “Head Above Water” is the debut Album from Dublin Singer/Songwriter Billy Treacy. Billy grew up over a pub in Dublin’s Inner City and is well known around the Temple Bar area due to his 3 year residency in The Ha’Penny Bridge Inn. In the past while living in Chicago he regularly opened up for touring Irish Acts such as Sharon Shannon, Stockton’s Wing and others. Head Above Water is a thirteen track album where Billy moves comfortably between Country, Americana and his own inherent Dublin Folk style. “These songs have come about from observing and commentating on what’s going on around me in Ireland today”. The lead track and latest single is (Track 1) “The Best Is Yet To Come”. The Album also includes previous singles and YouTube video hits the protest song “Woe!” and the controversial “Temple Bar”. Due for release in April with a launch night in Whelan’s on Wed 15th of April.